WASHINGTON - The United States has confiscated $800 million from senior Venezuelan socialist and alleged drug trafficker Diosdado Cabello, according to a Tuesday report from Miami journalist Óscar Haza. Cabello, a close ally of socialist dictator Nicolás Maduro and Vice President of the ruling United Socialist Party of Venezuela (PSUV), was recently sanctioned by the U.S. Treasury Department for corruption, drug trafficking, and mineral smuggling, thus allowing authorities to freeze his American bank accounts and seize all his property. “They have hit the heart of the engine room of his economic battleship, the product of drug trafficking and the business deals done for his benefit,” he continued. The report, which has not been independently verified, comes weeks after the U.S. sanctioned Cabello as well as a handful of other senior Venezuelan officials, including Maduro. 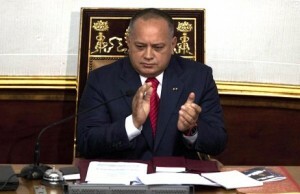 However, Cabello dismissed the report as a baseless lie perpetuated by right-wingers. In April, Cabello lost a lawsuit against the Wall Street Journal after they exposed his deep ties to drug trafficking, where they revealed that law enforcement agencies were investigating him over his alleged involvement with the Cartel de los Soles, one of the largest cocaine-trafficking organizations in the Western Hemisphere. The 55-year-old politician is currently a member of the National Constituents Assembly, a fraudulent lawmaking body of unelected government supporters. He has previously served as Venezuela’s vice president under Hugo Chávez, as well as president of the country’s National Assembly before his party lost control of the lawmaking body in 2015.